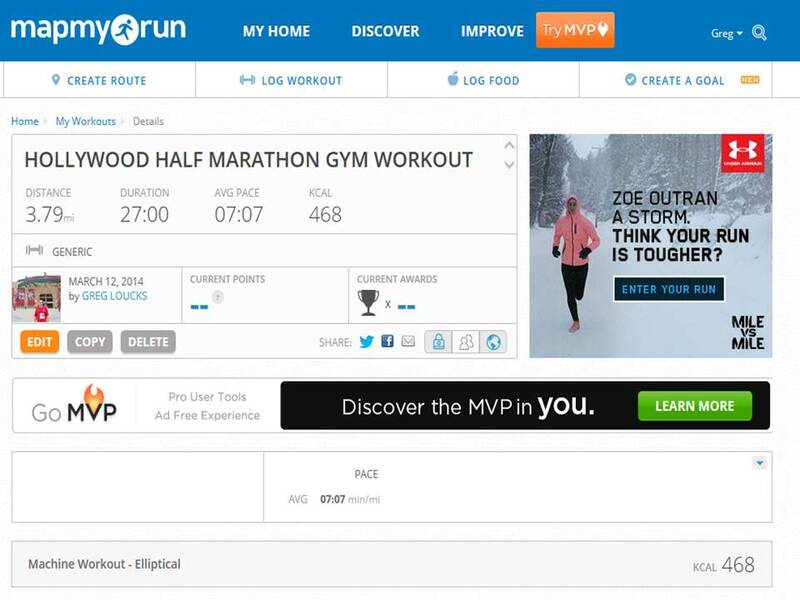 Yesterday, news circulated around the runDisney social media groups. Changes are coming. Starting with the 2014 Disneyland Half Marathon Weekend, you will only be able to pick up your own participant packet (race bib, race shirt, etc.). The previous policy allowed for you to have someone else pick up your participant package provided you had given that other individual your signed waiver and a photo copy of your ID. So, starting with the Disneyland Half Marathon Weekend this year, you will have to be present in order to pick up your packet. Patty from Margaritas, Miles and the Mouse reports that runDisney will allow for same day package pick up starting 2 hours before the race starts. You can read her report here. The opinion that Patty shares seems to be a popular sentiment among the runDisney enthusiasts. The reason for this new policy is probably aimed at discouraging the sales of unused race bibs from the popular runDisney events. Given that these events sell out so quickly these days, if you aren’t able to purchase your race registration on the first day it is open to the general public (or second day), you’re most likely out of luck on getting into these races (especially the Disneyland races). It wouldn’t surprise me at all to find that there are people who pay the registration fees for runDisney races they never intend on racing only to sell them at a profit later. So, this new policy would appear to address this problem. Like Patty, I agree that the timing of this announcement and the timing of their first event to enforce this policy is where the problem lies. 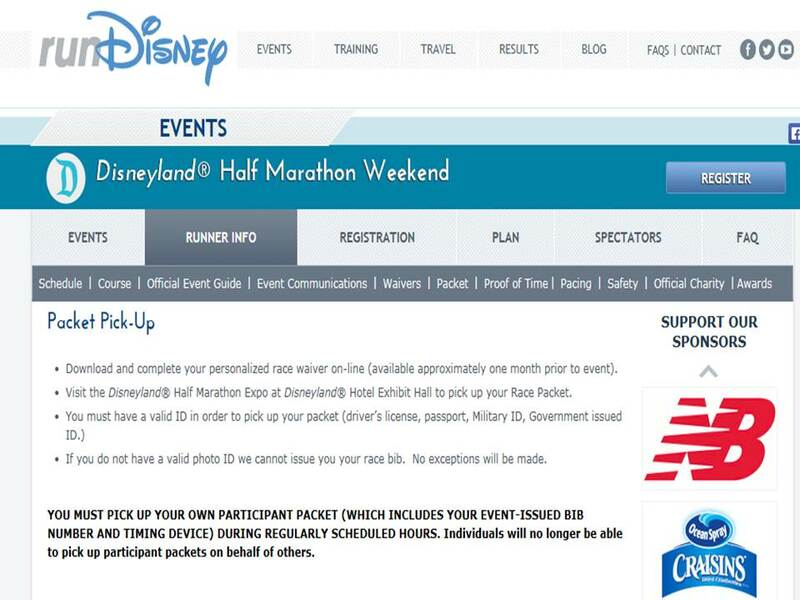 If you’ve already purchased airline reservations and hotel accommodations for the Disneyland Half Marathon Weekend where you get into town after the Expo closes on the day before your race because you have already worked out for a friend to get your packet for you, this new policy could have been a big issue. I’m glad that runDisney is allowing for race day package pick up for the Disneyland Half Marathon Weekend. That seems fair. What is uncertain is whether the race day package pick up option will be open to other races that have not opened their registrations yet. After all, runDisney could recognize this timing issue and offer the race day pick ups as a way of recognizing some folks have already made their travel arrangements assuming the old policy would be in effect on their race. However, once the new policy is known, they could very well take away the race day pick up option. Other races operate like this. 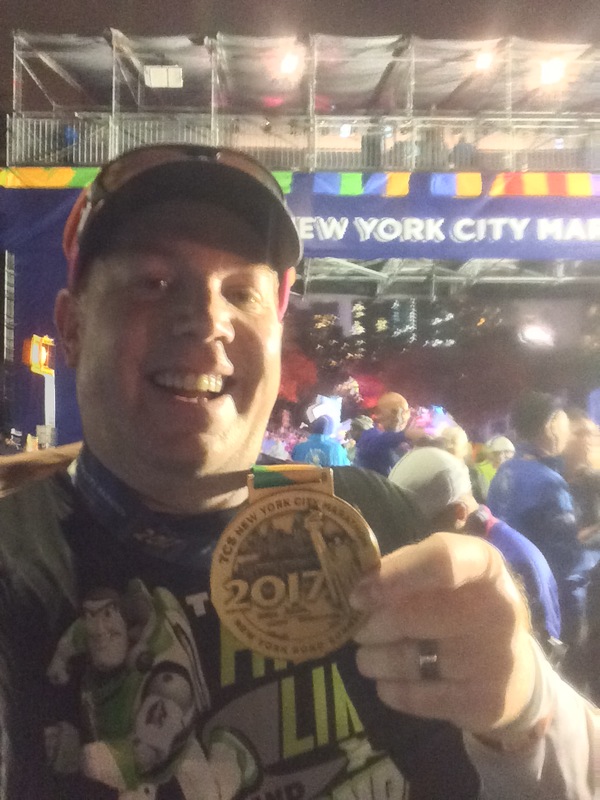 So, it would not be unheard of for runDisney to follow suit. When I ran the Rock n Roll Los Angeles Half Marathon last October, this was the policy. You had to pick up your own packet and they did not offer race day pick ups. So, time will tell if race day package pick ups becomes the new norm or if it’s merely a transitional policy to accommodate those who registered under the assumption that the old policy was still in effect. I did get out to LA Fitness last night for a mid-week gym workout. I can’t remember the last time I made it out for a mid-week workout. This is probably the first time this year that I’ve done so. After all, since I’m not a morning person, I have to go after work. At the start of the year, all those new resolution people crowd the gym. By the middle of February, they’re gone. Since LA Fitness purchased Bally’s Total Fitness, my gym has been busier than it was before. So, the start of the year is insane. Currently, I go to the gym to use 4 machines…the elliptical machine, the ab crunch machine, the leg press machine, and the assisted pull ups/dips machine. When it’s crowded, the order in which I use these machines will vary. However, I always start off with the elliptical machine. I tried to get a better picture of the display of the elliptical machine after I finished. Darn flash on my phone’s camera didn’t give you the distance covered. Also, because I have a limited time before the display resets itself at the finish, I didn’t get the time to display either. 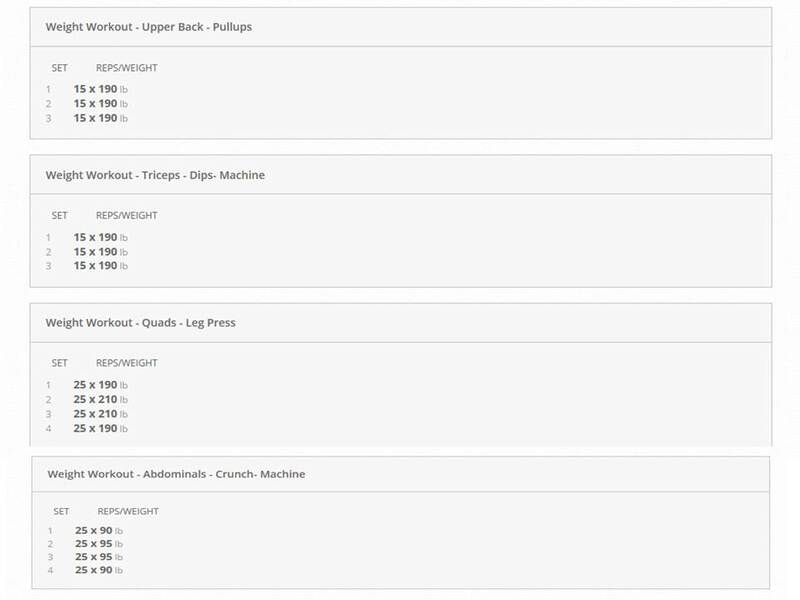 Here’s the screen grab of my elliptical workout from Map My Run. I use this app in conjunction with the Nike Plus app to enter gym workouts. I love the Nike Plus app, but it’s limited. I can’t seem to figure out how to enter workouts manually. Since I can sync Map My Run with Nike Plus, this is where I enter my gym workouts. It also keeps track of my runs as well. In case you were wondering how the rest of the work out went, here you go. 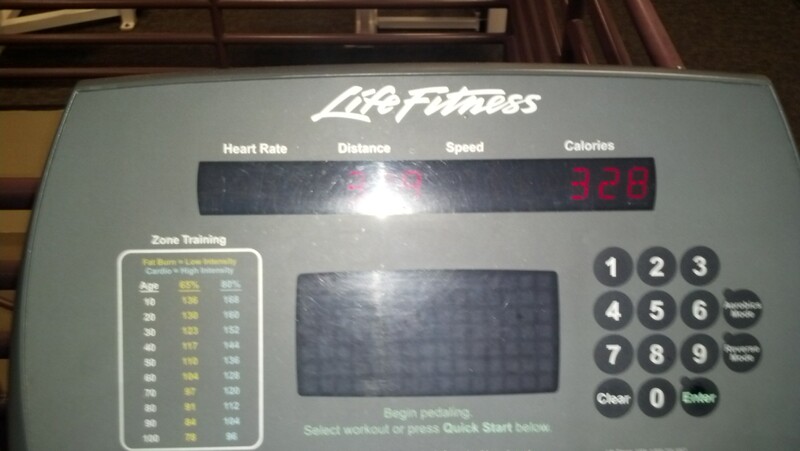 The Elliptical Machine – I was a little slower in my pacing on this machine than I had been previously. Part of that was I noticed my heart getting too high. So, I backed off the pacing to get better control over my heart rate. If you’re interested, for the time I’m on this machine, I pedal forward for the first 15 minutes, take a 15-30 second break and then finish pedaling backwards for the last 12 minutes (including cool down). The Assisted Pull Ups – On the last set of 15, I had to stop after 11. However, even with the stop, I made all 15. In the past, I was pretty good about making my sets without any stops. The assisted pull ups were the last machine and I was pretty tired by the time I got there. Tonight’s challenge is to run again. I’m hoping for 6 miles but will accept nothing less than 3. So, it’s either 1 lap or 2. I know that if I make it to the end of mile 4, I will finish all 6. My motivation this week is to get back at it with my training. I’ve seriously slacked off and want to change that momentum right away. 5 workouts this week is my goal. I haven’t finished 5 in one week in quite some time. However, as I thought about this week, 5 is what I really want to break me out of this slum and change my momentum. So, far, I’ve completed 2 and I know that you can never bank on any particular workout actually happening until it does. What you’ve seen above is what should be the norm for my gym workouts for the rest of this month. In April, I’m working on one or two 30 day challenges. 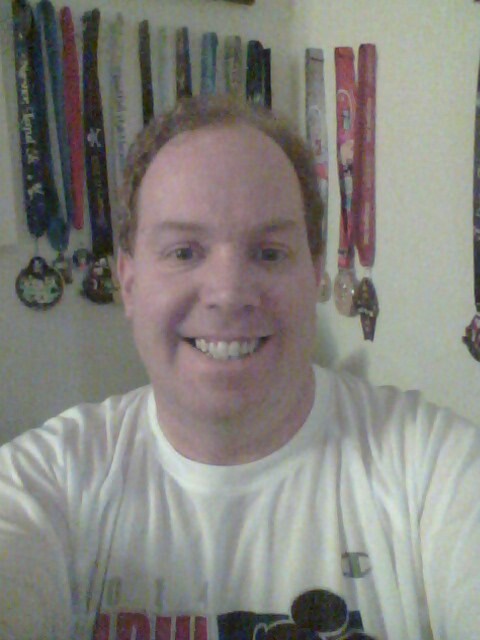 If I want to reach my goal of a 2 hour, 30 minute half marathon, I need to get stronger and improve my conditioning. To improve, I need to be consistent. I know I’ve packed a lot into this post. It’s sort of a two-part post. What do you think of the new runDisney policy on race packet pick ups? What sorts of cross training do you complete? Thank God it’s a Rest Day! I guess it was only a matter of time before Disney reacted to the rampant practice of people selling bibs and running under names not their own. I understand it from a legal perspective. They need to protect themselves. I’m really glad they’re having same day packet pick up. I hope it sticks! I totally get where runDisney is coming from. I wish they would have applied this new policy starting at a race that people had not yet signed up for so they could plan accordingly. These races sell out so quickly and people purchase their race entry based on what they know the race will be about. I wonder how knowing this new policy would be in place for the Disneyland Half Marathon Weekend would have affected those who are going if they knew about this policy beforehand. I’m sure the race would still sell out quickly. However, at least those who have paid the unrefundable entry fee would have been able to plan accordingly.